Medications prescribed for adults with attention-deficit/hyperactivity disorder (ADHD) have been associated with elevations in systolic and diastolic blood pressure and increased heart rate. Habel and colleagues assessed the cardiovascular safety of ADHD medications in a population-based cohort of 443 198 adults among whom 150 359 were users of ADHD medications at baseline. The authors found that compared with nonuse or remote use, current or new use of ADHD medications was not associated with an increased risk of myocardial infarction, sudden cardiac death, or stroke. In an editorial, Shaw discusses implications of the findings for the treatment of adults with ADHD. A cardiac troponin level exceeding the 99th percentile is diagnostic of myocardial infarction (MI), and sensitive troponin assays have been developed for evaluation of patients with chest pain. In a cohort of 1818 patients with suspected acute coronary syndrome, Keller and colleagues compared the diagnostic performance of a highly sensitive troponin I (hsTnI) assay with a contemporary troponin I assay (cTnI). The authors found that hsTnI or cTnI determination 3 hours after admission was useful to rule out acute MI and found that serial change in troponin levels from admission (using the 99th percentile diagnostic cutoff level) to 3 hours after admission may facilitate early diagnosis of acute MI. Physicians and nurses who—based on their personal beliefs or professional knowledge—believe the care they provide is inappropriate may be at risk of moral distress and burnout. To assess the prevalence of and characteristics associated with perceived inappropriateness of care among physicians and nurses in intensive care units (ICUs), Piers and colleagues surveyed 1651 nurses and physicians who were providing bedside care in 82 adult ICUs in 9 European countries and Israel on a single day in 2010. Among the authors' findings were that perceptions of inappropriate care were frequently reported and that such perceptions were associated with inadequacies in communication, decision sharing, and job autonomy. In an editorial, Halpern discusses potential consequences of inappropriate care perceptions for patients and clinicians. The US Food and Drug Administration has recommended that CYP2C19 genotyping be considered prior to prescribing the antiplatelet drug clopidogrel, but the American Heart Association and American College of Cardiology agree that insufficient evidence exists to support this recommendation. In a meta-analysis of data from 32 studies (involving 42 016 patients) that examined the association of CYP2C19 genotype with response to clopidogrel therapy, Holmes and colleagues found no clinically meaningful association between the CYP2C19 genotype and the effect of clopidogrel therapy on cardiovascular events. In an editorial, Nissen discusses the need for critical evaluation of the evidence underlying pharmacogenetic approaches to drug therapy. Medical experts at the NIH's Undiagnosed Diseases Program are combining genomics with traditional clinical evaluation to offer answers to patients with baffling conditions. Four commentaries discuss the new US Preventive Services Task Force draft recommendation against prostate–specific antigen–based screening. 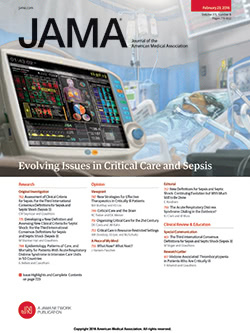 Call for papers for an upcoming JAMA theme issue. Dr Bauchner summarizes and comments on this week's issue. Go to http://jama.ama-assn.org/misc/audiocommentary.dtl. Join Harold C. Sox, MD, on January 18, at 2 PM eastern time to discuss the new American Cancer Society process for creating trustworthy cancer screening guidelines. To register, go to http://www.ihi.org/AuthorintheRoom. How would you manage care for a house officer with a needlestick injury? Go to www.jama.com to read the case. Submit your response by January 1. For your patients: Information about Cushing syndrome and disease.